Actions: progress on implementation of the Actions in the Plan by State agencies and local government. Measuring outcomes provides accountability in the delivery of the Objectives of the Plan. As the delivery of these Objectives involves many stakeholders and may rely on local planning and agency programs, the establishment of indicators would best be informed by the involvement of stakeholders. This will also enable consistency in monitoring and efficiencies in reporting. Learning from monitoring is a key factor in the ongoing review of any plan. A key consideration is to set up monitoring that is most beneficial for all stakeholders. How a region grows and changes can be masked by reporting over wide areas, as it can average out factors that may be very different when viewed at a local government level. Therefore, as discussed below, it is proposed that the development of the monitoring framework should include local government input, particularly the requirement of councils to monitor their local strategic planning statement. The approach to monitoring performance responds to recent changes to the Environmental Planning and Assessment Act 1979, following commencement of the draft Greater Sydney Region Plan exhibition, which creates an opportunity to consider a comprehensive monitoring, reporting and evaluation framework that recognises existing reporting requirements. The amendments require a clear line of sight between regional and district plans, the new local strategic planning statement and local environmental plans. The amendments also link the local strategic planning statement and planning proposals/local environmental plans to the requirements for councils’ community strategic plans under the Local Government Act 1993. Monitoring and reporting on implementation is required for the region plan, district plans and local strategic planning statements. The concurrent development of A Metropolis of Three Cities, Future Transport Strategy 2056 and State Infrastructure Strategy 2018–2038 also provide the opportunity to identify performance indicators that can inform whole-of-government understanding of the delivery of the Plan. It is envisaged that a core group of indicators reported at a local, district, city and regional level could provide a framework for local circumstances to be identified. Indicators will be established for each of the 10 Directions that can best measure the outcomes set out in the Objectives of the Plan, and provide overarching coordination whilst allowing for local understanding (refer to Table 7). The Greater Sydney Commission is also responsible for providing support on the implementation of the region and district plans to councils. Leading the development of integrated performance indicators will be a key way the Commission will support implementation. The preparation of A Metropolis of Three Cities was informed by an understanding of the characteristics of growth and change. Key social, economic and environmental data is set out in the Greater Sydney Commission’s website in Productivity, Liveability and Sustainability Profiles which help inform the basis for the Plan. Key data sources include the Australian Bureau of Statistics Census and the NSW Department of Planning and Environment’s population, household and dwelling demand data used across the NSW Government. Monitoring context is consistent with the Australian Government’s National Cities Performance Framework. The framework includes context indicators of the characteristics that help inform an understanding of what a city is like and how it functions and provides comparisons to other cities. Infrastructure and Collaboration – analysing the impacts of changing factors in prioritising and delivering new and renewed major infrastructure. Liveability – analysing the impacts on liveability of changing factors in population, demographics, household and housing markets, and land use strategies. Productivity – analysing the impacts on productivity of changing factors in jobs growth, industry sectors, technologies, and work practices. Sustainability – analysing the impacts on sustainability of changing factors in resilience, hazards, technological advances, resource management and environmental policies. The collection of more detailed data is required to better inform housing and employment analysis. Monitoring housing types, mix and affordability is an important part of delivering housing diversity. Much of this data will come from council housing strategies that will be developed to identify 6-10 year housing targets. A deeper understanding of employment sectors is to also be developed. This has three main components. For industrial and urban services land an expansion of the NSW Department of Planning and Environment’s Employment Lands Program will be informed by the review of the industrial and urban services land in the Central City District, on issues such as demand, mix and density of jobs, and the pipeline and characteristics of zoned and serviced land (refer to Objective 23). 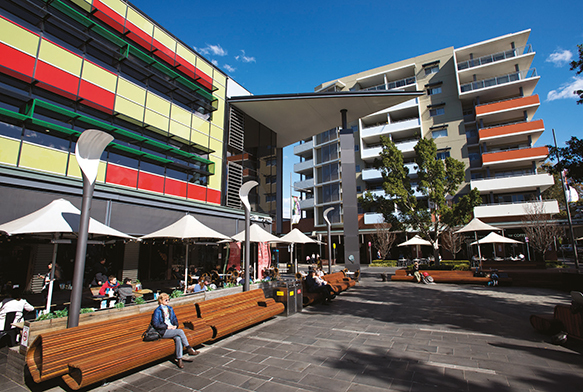 Regular monitoring of retail activity in Greater Sydney would help inform the development and implementation of retail policy being prepared by the NSW Department of Planning and Environment. This would identify trends based on the data established in 2015 providing updates on current supply, projected demand as well as changing characteristics in the retail sector (refer to Objective 22). In Greater Sydney the majority of standalone office development is located across nine commercial office precincts. Commercial office precincts have a range of employment sectors with different requirements. Monitoring would include consideration of all types of commercial office activities from global company headquarters to growing start-ups. Improving the understanding of the factors influencing supply and demand for office development would lead to more informed land use policies which could enable greater choice for business to locate across Greater Sydney. District plan: the Actions required to deliver the Planning Priorities, which are consistent with the Objectives, Strategies and Actions of the region plan. Each of the 14 Actions of the Plan have a lead agency responsible for coordinating the delivery of the Action (refer to Table 8). The monitoring of Actions will be undertaken at regular intervals as relevant to each Action and established with each lead agency. The monitoring will be reported annually. District Plans contain many more Actions, as it is the role of the district plan to establish the Planning Priorities for the implementation of the region plan by councils at the local government level. These Actions inform the local strategic planning statement. Councils’ strategic planning under the Local Government Act 1993 is required to have ‘due regard to relevant State and regional plans of the State government’. Reporting on the implementation of Actions by councils requires a focus on the delivery through local strategic planning statements and local environmental plans which is further detailed in District Plans. 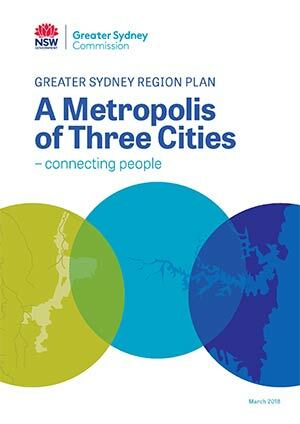 The Greater Sydney Commission is required to report annually on the implementation of the Plan. Develop performance indicators in consultation with State agencies and councils that measure the 10 Directions to inform inter-agency, State and local government decision-making. Develop detailed monitoring and reporting of housing and employment in Greater Sydney. As Greater Sydney grows and becomes more complex there is a need to design better ways of supporting growth and delivering appropriate infrastructure in the right places. A city supported by infrastructure will be measured against the outcomes achieved by city-shaping infrastructure that facilitates the three cities and city-serving infrastructure that is sequenced and aligned with forecast growth. Collaboration between government, industry and local communities will result in the best use of resources such as public spaces, school ovals and community facilities. A collaborative city will be measured against the outcomes achieved by all levels of government, industry and the community working together. Improved quality of life can be achieved by co-locating schools, recreation, transport, community and health facilities, social infrastructure and local services in walkable mixed-use places. A city for people will be measured against the outcomes achieved by improved access to local health, education, transport, recreation, social facilities and services. Providing ongoing housing supply and a range of housing types in the right locations will create more liveable neighbourhoods and support Greater Sydney’s growing population. Housing affordability is also a challenge that can affect job and lifestyle choices. Housing the city will be measured against the outcomes achieved by increasing housing supply and choice, and housing affordability. The creation and renewal of great places for people, together with better local accessibility through walking and cycling, will achieve local liveability that attracts and retains residents and workers. Great places exhibit design excellence and start with a focus on open spaces and a people-friendly realm. A city of great places will be measured against the outcomes achieved by improved local accessibility and connections, and design excellence. A Metropolis of Three Cities requires a well-connected Greater Sydney with new jobs, shops and services in well-located centres with efficient transport connections and safe and convenient walking and cycling routes. This creates a 30-minute city. A well-connected city will be measured against the outcomes achieved by improved access to metropolitan, strategic and local centres. Greater Sydney’s population growth needs to be supported by economic growth that enhances its productivity, export sectors and global competitiveness. Jobs and skills for the city will be measured against the outcomes achieved by increased business growth and investment, improved transport connections, economic agglomerations and target sectors. A healthy natural environment will be important to improve liveability, create healthy places, and mitigate the effects of climate change. A city in its landscape will be measured against the outcomes achieved by protected, restored and enhanced landscapes, waterways, coastline, natural areas, tree canopy and open spaces. In Greater Sydney, the sectors that contribute most to greenhouse gas emissions are energy (electricity and gas) used in buildings, transport and waste. An efficient city will be measured against the outcomes achieved by innovative management of water, energy, resources and waste in planning new development and infrastructure. Adapting to climate change is critical to Greater Sydney’s future resilience, together with responding to its natural and urban hazards. To be resilient, communities need social cohesion and access to economic resources. A resilient city will be measured against the outcomes achieved by managing the impacts of natural hazards on communities, and adapting communities to cope with more very hot days.